If you come to the end of a rainbow, what would you find? Maybe a pot of gold. 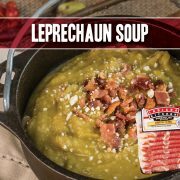 Or maybe a pot of this delicious Leprechaun Soup featuring Indiana Kitchen bacon! In a large pot over medium-high heat, melt butter. Add peas, chopped lettuce and green onions. Saute vegetables, stirring frequently, until the white parts of the green onions become translucent. Add broth and bring to a boil. Reduce heat and simmer uncovered for about 8 minutes, or until peas are tender. Meanwhile, in a pan, fry bacon to desired doneness. Then set aside on a plate lined with paper towel. Once cooled, crumble the bacon and save for garnish. Puree soup mixture in blender in 1-cup batches. Return to pan. Add corn and continue cooking for 2-3 minutes, until heated through. Season with salt and pepper to taste. 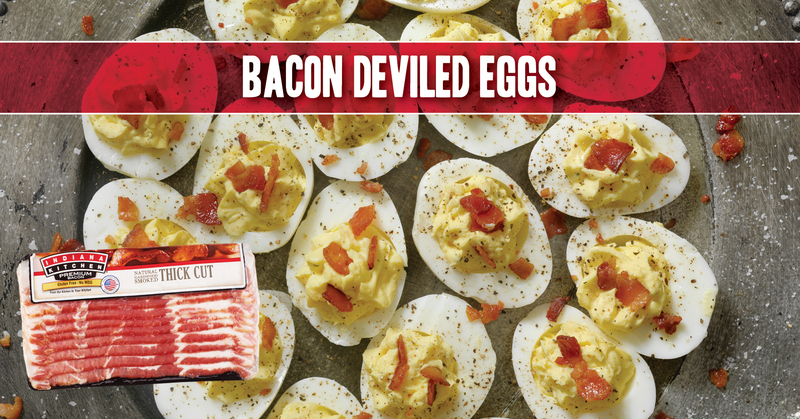 Serve with crumbled bacon and dollop of sour cream or parmesan cheese as garnish. 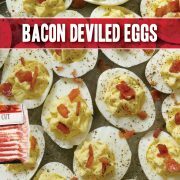 And on the twelfth day of Christmas, my true love gave to me, all the Bacon Deviled Eggs, featuring Indiana Kitchen bacon! In a medium frying pan over medium-high heat, cook bacon, turning slices as needed, until browned on both sides and crisp. Transfer to paper towels to drain. When cool enough to handle, crumble bacon. Cut each egg in half lengthwise; gently scoop out yolks and place in a bowl. Mash yolks with a fork, then stir in mayonnaise, green onions, mustard, and crumbled bacon until well blended. Add salt and pepper to taste. Spoon or pipe about 1 tablespoon yolk mixture into the hollow of each egg-white half. Serve immediately or cover and chill up to 4 hours. The only problem with this recipe? They'll beg you to host Thanksgiving every year from here on out. The bacon "cap" ensures a juicy bird, while the maple glaze on the outside and sage butter on the inside offer up awesome autumnal flavors with every bite. An hour before roasting, take turkey out of fridge, unwrap, and remove bag of giblets and/or neck (check both neck cavity and body cavity). Place turkey on a rack in a large roasting pan, breast side up, to allow it to dry and come to room temperature. Place oven rack in the bottom third of the oven and remove the top rack. Preheat oven to 350°F. Stir minced fresh sage into softened butter until well combined. Season well with salt and pepper. Sprinkle the turkey, inside and out, with salt and pepper. Carefully slide your fingers under the skin of the breast and drumsticks to lift it away from the meat. Slip spoonfuls of sage butter underneath the skin and smooth over the top of the skin to spread out the butter mixture into a thin layer. Repeat everywhere that you can reach under the skin until all of the butter has been used. If you are stuffing your bird, fill it with dressing without packing too tightly. If you aren't stuffing your bird, you may place a few aromatics (i.e sage, garlic, seasoning) inside the cavity, but it's not required. Then truss the turkey legs. Combine maple syrup and hot water. Use a basting brush to baste the entire turkey. Place turkey in the oven for 2 hours, basting with maple syrup every 30 minutes. If the breast and/or the tops of the drumsticks turn golden brown before the rest of the turkey, shield them with foil. After 2 hours, remove the turkey from the oven and insert a meat thermometer into the meatiest part of the thigh (without touching the bone). 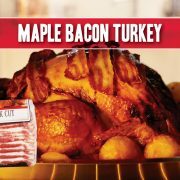 Baste the turkey with syrup again and arrange the strips of bacon over the top of the turkey with no gaps in between them, until they cover the entire breast. 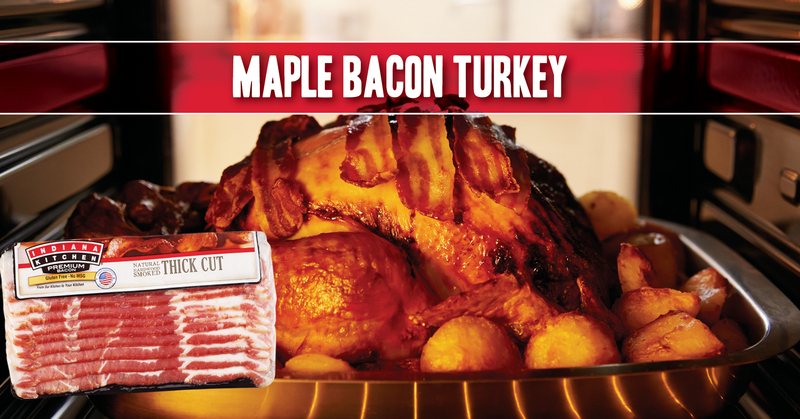 Return the turkey to the oven for about 30 minutes, then baste with syrup again (bacon and all). Continue cooking, watching the bacon closely so that it turns crisp but does not burn. If the bacon is done before the thermometer inserted in the turkey reads 165°F, shield the bacon with foil (as well as any other parts of the turkey that are brown enough, which might end up being the whole turkey) and continue cooking until the turkey is done. (a turkey typically takes around 13 to 20 minutes per pound to cook). Once the temperature of the turkey reaches 165°F and the juices are running clear, tilt the turkey in the pan so that the liquids run out of the cavity. Transfer turkey to a cutting board, tent with foil, and let it sit for 30 minutes. In the meantime, skim the excess fat from the pan drippings. Pour the drippings into a medium pot, scraping brown bits at the bottom of the roasting pan from the turkey but leaving behind any burnt maple syrup sludge. Set pot over medium heat and whisk flour into the drippings until smooth. Gradually add chicken stock while continuously stirring. Raise heat up to high and bring pot to a simmer while stirring regularly, until sauce is thickened to your preferred consistency. Season it with salt and pepper, to taste, and a squeeze of fresh lemon juice. No matter what happens on the field, the next football game you attend will be an instant classic with this incredible tailgate show-stopper, featuring Indiana Kitchen bacon. Whisk together ranch dressing and hot chile paste in a large bowl. Mix in chicken pieces and toss to evenly coat. Cover the bowl with plastic wrap and marinate in the refrigerator for 1 to 3 hours. Preheat an outdoor grill for medium-high heat and lightly oil the grate. Remove chicken from the bag and transfer to a plate or baking sheet lined with paper towels. Thread a piece of onion about 1 1/2 inches down the skewer. Thread the end portion of one strip of bacon onto skewer so the rest of the strip is hanging down. 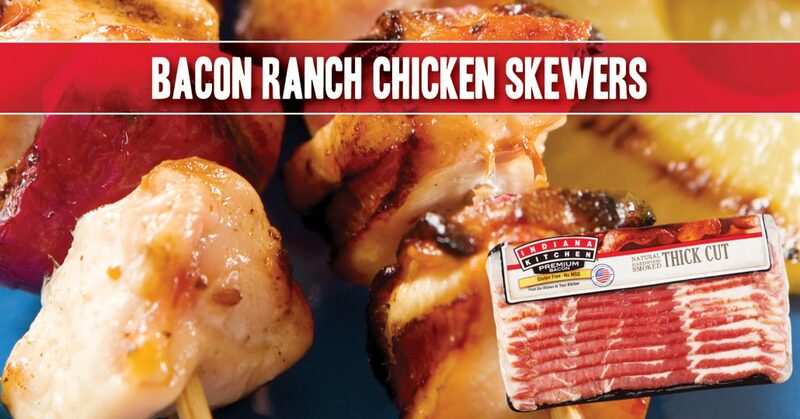 Skewer on a piece of chicken; thread on the next portion of the bacon. Turn the skewer so that the long end of the bacon is again hanging down. 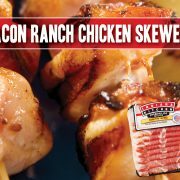 Repeat this process of skewering and turning until the entire strip of bacon is threaded, using 4 to 5 chicken pieces. Thread a second piece of onion onto the end of the skewer. Repeat steps 5 through 7 for all twelve skewers. Season chicken skewers with salt and pepper as desired. Cook the skewers on the preheated grill, turning every 3 to 4 minutes, until nicely browned on all sides and the meat is no longer pink in the center, 12 to 16 minutes total per skewer. Serve with ranch dressing as a dipping sauce. It's summertime and the livin' is easy: Grilled ham steaks & fresh chopped salsa--this summer dinner couldn't be any simpler or more delicious! To make summer salsa, combine mango, avocado, red onion, habanero, cilantro, lime juice, olive oil, salt and pepper in medium bowl. Let stand at least 30 minutes to allow flavors to blend. Spray cold grate of outdoor grill with grilling spray. Preheat grill to medium heat. Grill ham steak until just beginning to brown on outside. Serve ham steak topped with the summer salsa. Who needs the morning drive-thru window when you can make your own Ham, Egg & Cheese Biscuit in five minutes flat? Bake your biscuits the night before and store in the fridge to make the morning even easier. 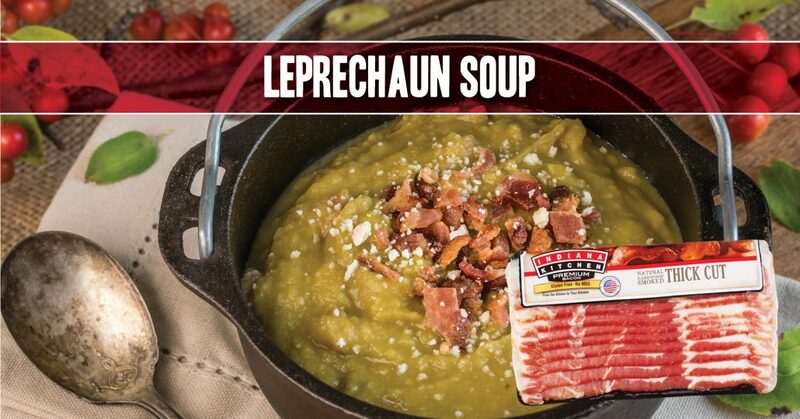 Featuring Indiana Kitchen ham! Add a drizzle of oil to two large frying pans and place each over medium heat. Break eggs one at a time into pans, keeping some space between them. Sprinkle eggs with salt and pepper. Cook 1 1/2 to 2 minutes or until eggs are set on bottom. Carefully turn eggs over; cook other side until center is firm. Meanwhile, remove biscuits from fridge, split in half and place on foil-lined baking sheet. Top each bottom half with 1 slice of cheese, 1 slice of ham and 1 egg. Cover with top halves of biscuits. Bake at 375°F for 2 to 3 minutes or until cheese is melted. Fresh baked biscuits should stay good for about one week if refrigerated. Delight a full dinner table with this gorgeous glaze, featuring oranges, bourbon and a little Dijon mustard! Move oven rack to lower-third level and preheat oven to 325 degrees F.
Whisk all ingredients (except for the ham) in a mixing bowl to make glaze. Pat ham dry with paper towel and place on roasting rack in large pan. Then brush all sides except for the bottom with 1/2 cup of the glaze. Cover loosely with foil and bake for about 2 hours or until ham's internal temperature reads 125 to 130 degrees F.
Once ham reaches temperature, take out of the oven and remove the foil. Turn oven's heat up to 425 degrees F and brush another 6 tbsp of glaze on all sides of ham. Return to oven, brushing a second and third round of glaze every 6-7 minutes or until outside turns a rich, golden color. Remove from oven and let ham rest for 20 minutes before eating. Enjoy! Classic Irish comfort food! Use this recipe to celebrate St. Patty's Day tastefully!If you like buttery, flaky crust and you have small, 6" pie tins, you can make a batch of mini-pies as shown. Or you can make a larger casserole-batch in an oven-safe baking dish with crispy pie crust as a lid! Melt 3/4 of your butter in a large frying pan on medium-low heat. Then add onions, season with salt and pepper and fry for about 15 minutes or until softened and caramelized. Add remaining butter to pan and melt. Then add flour, cooking for 1 minute, whisking to combine with onions and butter. Gradually add chicken stock, whisking to make the mixture smooth. Reduce heat and simmer for 3-4 minutes. Add mustard, cream, and another pinch of salt and pepper and stir. Let cook for another minute. Add ham and cabbage, stir and set aside. If making mini-pies, layer your tins with pie crust, add ham-cabbage mixture, then top with round lid of pie-crust, brushing with egg and pinching edges down with fork tines.If making pie crust-lidded casserole version, fill baking dish with ham-cabbage mixture, then top with pie-crust layer, brushing with egg yolk and pinching edges down with fork tines. Bake mini-pies in oven for 35 minutes, or if making casserole-style, for 25 minutes, or until pastry top is golden. Enjoy a delicious bowl of hearty green goodness with this Split Pea and Ham Soup Recipe! This soup is both a perfect warm-up meal for cold fall and winter days and a great way to use leftover holiday ham. Melt the butter in a large pot over medium-low heat. Once the butter is melted, add the onion, celery and garlic. Sauté, stirring slowly until onions are translucent but not browned, about 5 - 8 minutes. Add ham, peas, bay leaf, chicken stock and water. Stir to combine and simmer until peas soften and soup thickens, about 75 minutes. Season with salt and pepper to taste and enjoy! Just grill, glaze and you're good to go with this super-simple tenderloin recipe! Featuring Indiana Kitchen pork tenderloin! 1 pork tenderloin about 1 to 1 1/2 lb. Season tenderloin with salt and pepper. Then place over medium-hot fire and grill for about 15 minutes or internal temperature reaches 145 degrees F. Rotate tenderloin half way through cooking time. While tenderloin is cooking, mix apricot jam or preserves, mustard and crushed garlic in a bowl. he last few minutes of grilling, take half of the mixture and brush on tenderloin, reserving other half as sauce to apply during mealtime.